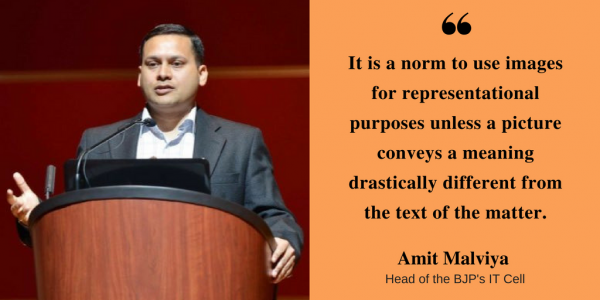 Amit Malviya tells ThePrint original visuals from the state were too gory to publish. Says it is a norm to use images for representational purposes. With some BJP leaders accused of posting on social media fake photos and videos of communal violence in West Bengal, the party’s national IT department head said on Wednesday that the visuals were used only for representational purposes as the originals from the state were too gory to publish. The comments by Amit Malviya came hours after West Bengal police arrested Tarun Sengupta, the BJP’s IT cell secretary from Asansol, in connection with such fake visuals. Earlier, Kolkata police had registered two cases against Delhi BJP leader Nupur Sharma for posting a picture of the 2002 Gujarat on social media with the hashtag #SaveBengal. West Bengal CM Mamata Banerjee has accused the BJP of circulating fake visuals on social media that are leading to communal violence in the state. While the visuals have triggered a social media outrage, Malviya justified the use of the “representational pictures” by Nupur. “TMC apologists will do well to focus on the never-ending cycle of violence in Bengal instead of a picture,” Malviya said, referring to the outrage over the controversial visuals. Calling West Bengal a police state under Mamata Banerjee’s rule, Malviya criticised the arrest of Sengupta.